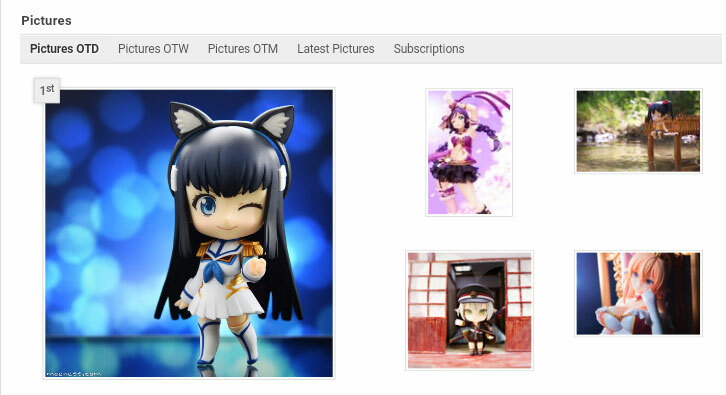 Firstly I would like to thank the community at MyFigureCollection for their participation, the response to the photo was overwhelming that not only it won Pic of the Day but within 48 hours it went on to be the Top 5 for Pic of the Week. 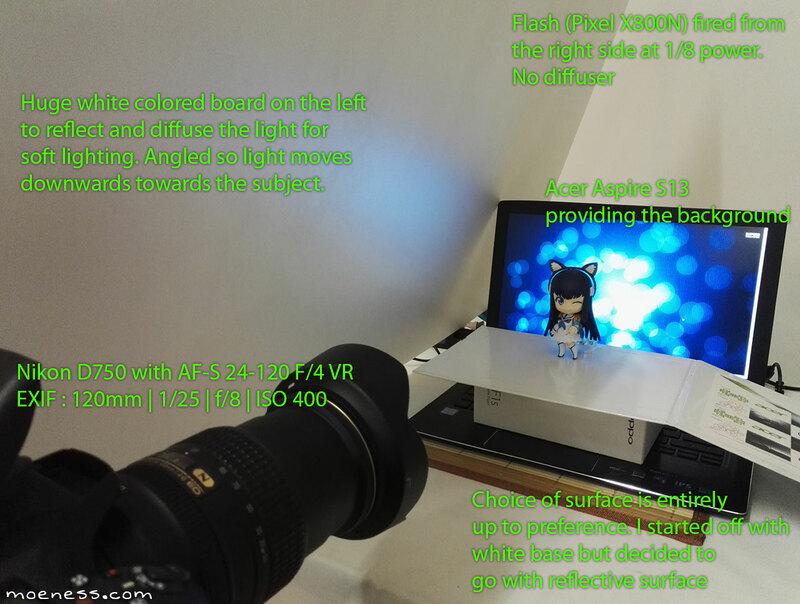 Seeing that there’s so much interest in this image, I thought I’d share about the shooting process of the image. 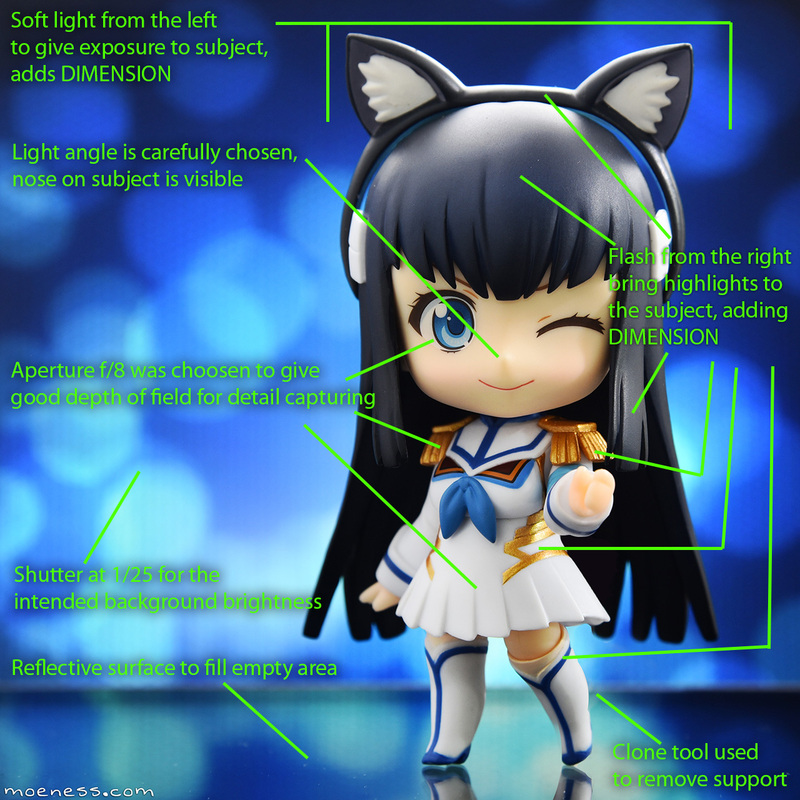 Without further ado, here are the images that I created and I hope that it would be a good guide for you. Here’s what the setup looks like. Here’s the result, I’ve taken the liberty to highlight various aspects that enhance the overall image. Do visit the image at MyFigureCollection. For the figure’s setup is simple, I used Nendoroid Kiryuin Satsuki  with Kirisaki Chitoge  face plate and Nakano Azusa  cat ear hairband. With the figure in place, the tricky part comes to photographing it. My idea for this shot is to use a monitor (computer screen) as a background. The key to getting such a setup right about using monitor as a background requires understanding of many aspects, exposure being one of them. I’ll have a tutorial for this next time. Once I got the background and exposure correct, it’s about placement of the subject against the background. I took many shots just to try out get the right lighting, exposure for subject, exposure for background, subject positioning, and so on so forth. By now I had fire 36 frames and during the course of post-processing was when I felt that that there’s something amiss with the background as there was an area that’s too bright and it becomes a distraction. Back to the mini-studio and 21 more frames were taken. This includes additional frames for plain background for post-processing as I need to remove the support stand. Mid way through post-processing the photo of choice I felt that I can do more for the photo and a brilliant idea came in – make the surface reflective instead! So I went about looking for my 1st generation Apple iPad and I used it as the base for the image. Another 6 frames were taken this time, that’s a grand total of 63. During the post-processing I removed the base and made the subject a little brighter as the previous setup was done with a white base so that affected the subject’s exposure a little. INFO : All photos were taken in JPG.